As educators struggle to motivate more students to take up technology-related majors, breakout online education startup, Khan Academy, has a novel approach. “Computer Science is an intensely creative field,” says Shantanu Sinha, President of Khan Academy, which gave TechCrunch an exclusive look at their brand new education portal that teaches Computer Science fundamentals through interactive drawing. “We really wanted to focus on creating something that could inspire young children, and get them excited and motivated to explore CS further.” The portal’s interactive design is a major evolutionary step for a website that has since been almost entirely based on YouTube lectures (with over 178 million views). I rarely get excited about online education, which often just recycles our antiquated education system into a digital format, but the new Khan Academy Computer Science project is beyond impressive. The new Computer Science site focuses on the critical early adolescent years, where children broaden (or narrow) their interests and identity before high school. The lessons don’t get much more complicated than basic algebra, and how these intuitive mathematical concepts can create powerful artistic, video game, and website experiences. “We wanted to create something that could get anyone with minimal knowledge of Computer Science really excited by the field–no matter what their age or situation,” says Sinha. 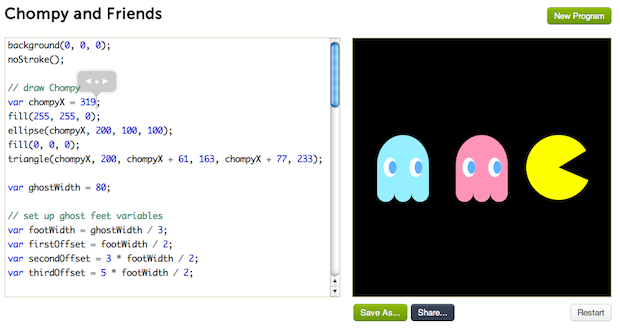 One of the most advanced lessons, for instance, is a replication of Pac-Man (i.e. a circle eating other smaller circles) and stops short of a university-level Computer Science course. The heart of the design places a simplified, interactive text editor that sits adjacent to the code’s drawing output, which updates in real time as students explore how different variables and numbers change the size, shapes, and colors of their new creation. An optional video guides students through the lesson, step-by-step, and, most importantly, can be paused at any point so that they can tinker with the drawing as curiosity and confusion arise during the process. This part is key: learning is contextual and idiosyncratic; students better absorb new material if they can learn at their own pace and see the result of different options in realtime. The pedagogy fits squarely into what educators called “scaffolded problem-based learning” [PDF]; students solve real-life problems and are encouraged to explore, but are guided by a teacher along the way, who can point out novel ways of accomplishing the task. Scaffolded learning acknowledges that real-life problems always have more than one path to a solution, that students learn best by doing, and that curiosity should drive exploration. This last point is perhaps the most important, since one of the primary barriers to boosting science-related college majors is a lack of interest. Combined with their new textbook-replacing iPad app and their ongoing experiments in schools, this new Computer Science platform gives Sal Khan one very realistic step forward towards his vision of creating an interactive, personalized education system. We encourage our readers to come see Khan speak at our annual conference, Disrupt SF, September 10-12.